Histories of psychological warfare often lack an understanding of how communication technologies, such as leaflet dropping, are received on the ground. In this excerpt from her PhD research on 1950s Cyprus, Maria Hadjiathanasiou explores how local factors affected the outcome of the propaganda war between British imperial forces and Greek Cypriots. We have been too much on the defensive… I feel very strongly that we must step up our propaganda on Cyprus, and make it much more vigorous, offensive and robust. Our success was due, not to experience, but to my deep understanding of Cypriot psychology and my ‘sense of war’ – the quality of judgment that brings correct decisions in moments of crisis. The ‘Cyprus Emergency’ (1955-59), one of Britain’s ‘small wars’ that took place during ‘the long twentieth century’, has received only limited attention from historians. As a result, even less is known about a specific aspect of this aggressive encounter between colonizer and colonized: propaganda. My doctoral research reveals that propaganda and counter-propaganda campaigns were being waged by Greek Cypriot and British forces in the island, targeting the Greek Cypriot public’s ‘hearts and minds’. Focusing on the period between the end of the Second World War until the island’s independence in 1960, my work explores these adversaries’ respective strategies and tactics, as well as the problems they encountered on the ground. During the years of the ‘Cyprus Emergency’ the British colonial government, was “very much on the defensive” with regard to propaganda issues, as Field Marshal Harding observed upon his arrival in the island in October 1955. He was sent there as Governor to restore “law and order” by containing the Greek Cypriot insurgency that was headed by EOKA, the guerrilla National Organisation of Cypriot Fighters, and supported by Archbishop Makarios III Cyprus’s Ethnarch, the elected religious and political leader of the Greek Cypriot population. Makarios and EOKA had a major influence upon the majority of the Greek Cypriots’ ‘hearts and minds’. Harding, as the new Governor, sought to reverse this process, or at least find a solution that would be accepted by all interested parties (Britain, Greece, Turkey, Cypriots) in a place where “the law had ceased to function”. Lieutenant Colonel Arthur Campbell, serving in Cyprus during the Emergency, observed that “the machinery on the island for waging the campaign for people’s minds was inadequate, and indeed the problem was never solved. It proved impossible to conjure out of the air a propaganda organisation that had any chance of countering the long-term brain-washing of Makarios and his henchmen.” The island became independent in 1960. However, in order to understand why British propaganda efforts failed, we have to look into the colonial government’s attempts to pursue a form of propaganda and psychological warfare in Cyprus from the beginning of the early 1930s. Arguably the events of 21 October 1931 were the turning point in Anglo-Greek Cypriot relations. On that day, after fifty-three years of British rule in Cyprus, crowds of heavily taxed Cypriots, impoverished and frustrated, marched outside the Government House in Nicosia, protesting against their imperial masters. Many were armed with sticks and stones. Colonial police were summoned. People were shouting, demanding enosis (union) with Greece. A young Greek Cypriot student climbed the flagpole, took down the British flag, and raised the Greek one. Soon afterwards, the wooden building was set on fire and burned to the ground. Government House after the fire, Nicosia, 22 October 1931. The lack of sufficient contact – largely due to language barriers – between the administration and the Cypriots during the first half of British rule (1878-1931) had substantially favoured the conditions for the dissemination of Greek and Greek Cypriot propaganda. The 1931 riots were a shock to the colonial government which up until that point was accustomed to believe that the Cypriots “didn’t have it in them” to cause “serious trouble”. After the humiliating events of October 1931, the colonial government imposed repressive reforms in its attempt to reinstate “law and order” in the colony and instill “public spirit” in its subjects. Constitutional government in the colony was suspended, the display of the Greek flag was forbidden, all political parties were banned, ten communal leaders were deported, two thousand Cypriots were jailed and the press was severely censored. In a ‘better-late-than-never’ state of mind, the colonial government embarked on a series of ‘experiments’ in cultural influence in the fields of education and social welfare. These aimed at convincing the Cypriots of the significance and benefits of ‘the British connection’, and persuading them to refrain from the tiresome-to-British-ears request for enosis. Back in London, Sir Stephen Tallents, secretary of the Empire Marketing Board (1926-33), published a pamphlet The Projection of England (1932). Here, he emphasized the necessity of “studying the minds of those to whom our projection is addressed…we must master the art of national projection and must set ourselves to throw a fitting presentation of England upon the world’s screen.” This, he argued, would promote “good international understanding, within the Empire and without it”, for the sake of British export trade, tourist traffic, and “in the discharge of our great responsibilities to the other countries of the Commonwealth of British peoples”. However, Tallents was leading an operation whose funding, composition, and activities were often harshly criticised by the more conservative minds of his government. Tallents, who would prove to be an insightful public relations expert, was actively promoting the significance of information services within the Empire and the study of conduct of enemy propaganda. In 1938 he expressed his innovative ideas in reports submitted to the British government. However, as one official tellingly commented, in these otherwise fascinating reports, there was “a good deal that busy minds may skip”. Indeed, “busy minds” in colonial outposts such as Cyprus, though attempting to re-orient the Cypriots toward British rule, (for example through the teaching of English as a foreign language, the circulation of British films and periodicals, scholarship schemes, and so on), could not succeed when their efforts were short of money and misconceived due to lack of expertise or simply lack of ‘appetite’ on the part of the colonial staff. During the Second World War, the colonial government in Cyprus recruited the slogan ‘Fight for Freedom and Greece’, as part of their propaganda campaign in order to convince the Greek Cypriots to fight willingly with the British and the Allied forces against the Axis powers. Cyprus never became a battleground during the War, save for limited air raids. Conscription was not imposed but Cypriot volunteers formed the Cyprus regiment, fighting in Greece under British command. At the end of the War the British administration in Cyprus relaxed the repressive measures imposed after the October 1931 events. The situation in Cyprus at that point, was not obviously revolutionary. Public order was not yet in jeopardy. Nevertheless, the atmosphere was deeply unsettled, and the sentiment of Greek nationalism as lively as it had ever been now that the lid of repression had been hesitantly lifted. 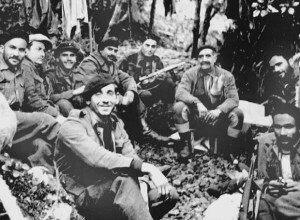 EOKA’s leader General Grivas (right of centre) and guerrilla fighters. In a new Cold War context, a debt-ridden Britain, in need of repaying its creditors, namely the newly emerged super-power the U.S.A., focused upon the exploitation of its colonies. The ‘minds’ of its foreign subjects therefore, were hardly at the centre of its concerns. Meanwhile, in post-war Cyprus, the Church having partly regained its privileges in the early 1940s, transformed itself into a public body that vigorously argued the case for Cyprus’ independence from foreign rule and its union with Greece – renewing the case it had been making along these lines since 1878. However, the Church’s campaign against British colonial rule intersected in complex ways with Cold War geopolitics. During the late 1940s, Britain was heavily involved in Greece, backing up the Greek monarchical military regime in its civil war against communist-led insurgents. In Cyprus too, the fear of ‘a red under every bed’, was translated into the government’s attempts to contain the influence of the local communist political party AKEL (Progressive Party of Working People). By the mid-1950s, wider global power politics had weakened the British imperium and the tide of mounting anti-colonial nationalism proved unstoppable. 1930s Palmerocracy (Governor Palmer’s autocratic rule in Cyprus between 1933 and 1939), and the broken promises of the Second World War, left many Cypriots with grievances. 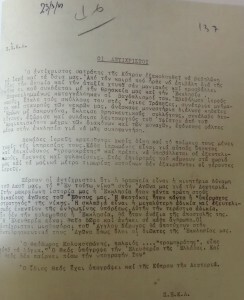 The government’s attempts to woo the local Greek Cypriot audience provoked harsh criticism, ridicule and boycotting, “by order of the ecclesiastical authorities”. 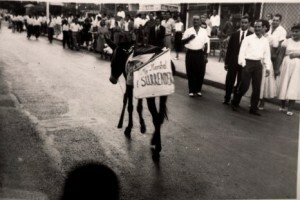 During the 1950s, Makarios, using the rhetoric of self-determination and invoking the ideal of enosis, pursued an ‘enlightenment’ policy that informed local and international publics about the validity of the Greek Cypriots’ demands in the light of global developments. His highly effective rhetoric appealed strongly to the Greek Cypriots’ sense of ‘Greekness’, and long-established ideals and symbols, such as union with “the motherland”, the Christian Orthodox faith, the Hellenic tradition, democracy and the prospect of freedom from foreign hands. Makarios was indeed preaching to the converted. On 1 April 1955, EOKA began its armed campaign against the British colonial forces. Despite its date of origin, the campaign, which started with a series of bomb explosions across the island, was by no means a joke. The local government was taken by surprise and the ensuing ‘Emergency’ would last for four years. It was at this point that the long-simmering psychological warfare between British colonials and Greek Cypriot counterinsurgents reached fever pitch. Field Marshal Harding, who had previously fought in both World Wars, tackled the Malayan Emergency and advised the British government on the Mau Mau Uprising, was on the ground. The Greek Cypriots now had to be courted or cowed, either by sweet-talk or recourse to fear; a whole gamut of persuasive rhetoric was deployed for these purposes, and the media were recruited to influence public opinion. A particularly popular method of seeking to influence hearts and minds was leaflet distribution. Harding ordered that pro-government and anti-EOKA leaflets should be airdropped by plane. Common themes of this literature were EOKA’s violence, terrorism and the corruption of youth. General Georgios Grivas, EOKA’s guerrilla leader, commented in his Memoirs that Greek Cypriots were not fooled by British propaganda efforts, and that they “knew the truth well enough”. A donkey bearing the sign ‘My Marshal, I surrender’ was released by EOKA into the streets of Nicosia in August 1956, ridiculing Field Marshal Harding’s demands. Meanwhile, Harding had re-censored the local press, and ordered the fining and arrest of counter-leafleteers. Most of these leaflets were written by PEKA (the Political Committee for the Cypriot Struggle), which was responsible for the ‘enlightenment’ of the public about the Struggle and for boosting their morale. Their content, written by Greek Cypriots for Greek Cypriots, was energetic, often witty and humorous, and definitely an incitement to passive resistance and sabotage. These leaflets sought to speak directly to the heart of the Cypriot, and were very often pitched against Harding and his men, with the Field Marshal being ‘adorned’ with nicknames, from ‘Gauleiter’ to ‘Fanfarrón’. PEKA’s leaflets were well-designed to reach their target and successfully distributed, very often carried secretly in Cypriot children’s skirts or socks, much to the frustration of the government’s Security Forces. 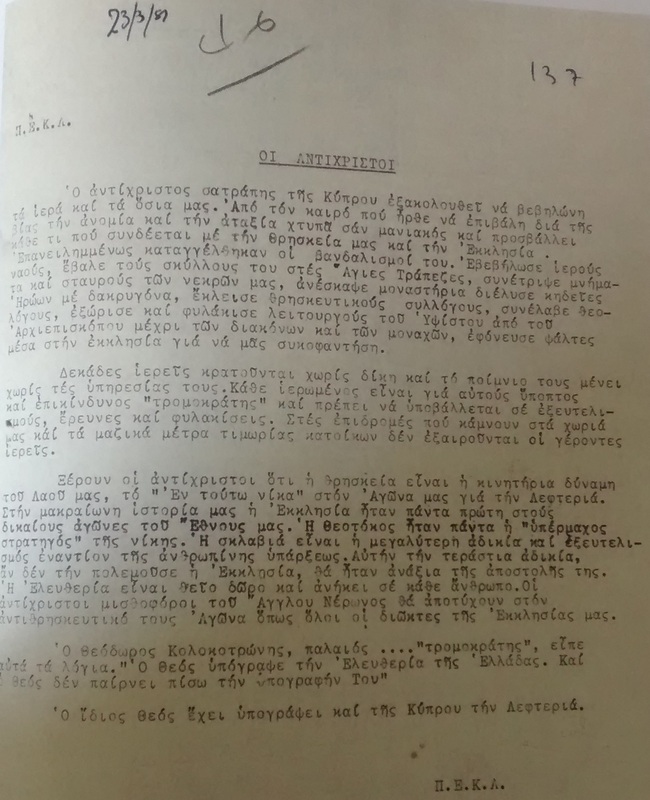 Original typescript of a PEKA leaflet dated 23 March 1957, Cyprus State Archives. Field Marshal Harding faced growing criticism from the international community as well as from within the United Kingdom; there were complaints about the methods he used in Cyprus and murmurings about their lack of effectiveness. He resigned as Governor in late October 1957, to be replaced by the diplomat Sir Hugh Foot. The latter sought an end to the Emergency, while negotiating with the interested parties for what led to Cyprus’ shaky independence in 1960. Interestingly, Grivas wrote that the moment when had Harding stated, at the beginning of his service, that he intended to apply his past experience to the situation in Cyprus, he had already lost the fight. According to Grivas, the British military’s inability to tackle the guerrilla insurgency was partly due to Harding’s lack of understanding of the psychology of his opponent. That opponent was not only made up of the EOKA fighters, but also large swathes of the Greek Cypriot population, which had been assisting the struggle with Makarios’s blessings. Harding’s old recipe of coercive ‘medicine’ for the people, which included curfews, collective fines, ‘village bashing’ (destruction of private property), cordon and search operations, interrogation, incarceration and most notoriously hangings of young EOKA members, “further aroused the people and hardened its resistance and pushed it towards the close embrace of the armed struggle”. This brief history of the emergency in Cyprus makes clear that propaganda and psychological warfare were treated by the Greek Cypriot insurgents and the British counter-insurgents as valuable weapons with which to serve their contrasting goals. Future researchers will find fertile ground in the study of psychological strategy during the British Empire’s ‘small-wars’. An expanded understanding of this topic would not only deepen our knowledge of the history of ‘the end of Empire’, but could also offer us information on the ‘wars of words’ in turbulent times, including our own. After all, such ‘Emergencies’ are, unfortunately, far from being extinct. Maria Hadjiathanasiou is a final-year PhD candidate completing a thesis entitled “The Stimulus of Rhetoric: Propaganda in Cyprus at the End of Empire, 1945-1959”, at the Department of Historical Studies, University of Bristol.